Reunion Celebration, July 3-5, near Lake Village, Ark. The reunion, with the theme “Memories of Lakeport,” was sponsored by the Lakeport Cemetery Preservation Project and Arkansas State University. Attendees, including visitors from as far away as Chicago and New Zealand, came to relay the history of life at the plantation for the slave population, which numbered around 155 in 1860. The reunion kicked off with a reception July 3 at the Mt. Pleasant Missionary Baptist Church followed by a full day of activities on July 4. Following an old-time breakfast, presentation topics included “African American Food Folkways, a history of Lakeport Plantation (known in its day as the “Big House”), restoration, research, and African American research projects, and a presentation on the importance of African history and heritage. Presentations on African American quilting and old-time health remedies preceded the Craig Lacy 4th of July picnic and tours of three local cemeteries. Quilts of the Civil War era often were sewn with certain patterns which, when hung outside, served as guidelines to directions to Underground Railroad locations. The day was capped with “Story Telling from the Elders” and African American music and celebrations. “The Lakeport Plantation is part of the physical survival of our past, but it was also a home. It was where our ancestors lived and worked and died,” said Rogers-Johnson. 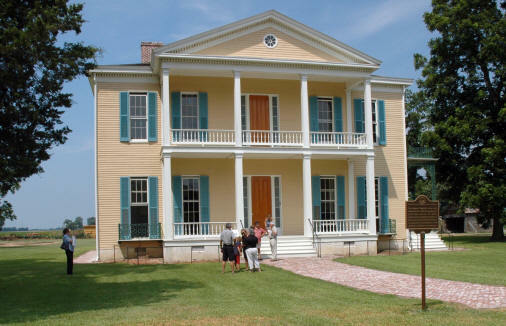 The Lakeport Plantation house, built in 1859 for Lycurgus and Lydia Johnson, is the only remaining Arkansas antebellum plantation home on the Mississippi River and has been on the National Register of Historic Places since 1974. In 2001, the home was gifted to Arkansas State University by the Sam Epstein Angel family. In 2002, it was designated as an official project of the Save America's Treasures Program by the National Park Service and the National Trust for Historic Preservation. The Lakeport restoration project followed the standards of the Secretary of the Interior and in September 2007, after five years of work, the home opened to the public. Dr. Ruth Hawkins is director of Arkansas Heritage SITES at Arkansas State University, which includes overall responsibilities for policies and programs at the Southern Tenant Farmers Museum, Lakeport Plantation in Lake Village, and the Hemingway-Pfeiffer Museum and Educational Center at Piggott. She is also executive director of Arkansas Delta Byways, a 15-county tourism promotion association that promotes Eastern Arkansas and its two national scenic byways: Crowley's Ridge Parkway and the Arkansas Great River Road. Dr. Blake Wintory serves at the assistant director and facilities manager of Lakeport Plantation. For more information, go to http://www.memoriesoflakeport.com/.